Improving our understanding of nerve cell myelination and remyelination in both animal models and humans may to improve treatment for demyelinating diseases such as MS.
MS is a debilitating autoimmune disease in which immune cells infiltrate the central nervous system and attack the myelin sheath surrounding axons. Dr. Simons explains that myelin is necessary for signal conduction by nerve cells and for the metabolic support of axons. Demyelination results in axonal loss and formation of lesions in the brain. A small percentage of MS lesions are capable of remyelination following steps similar to axonal myelination during normal development. 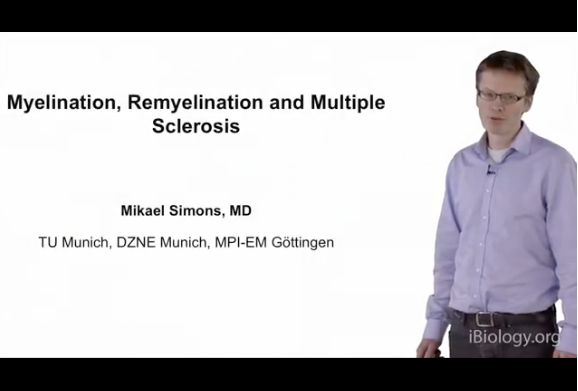 Since lesion remyelination correlates with reduced neurodegeneration, Simons and his colleagues strive to understand why remyelination occurs in only a small number of MS patients and to identify drugs that may promote it. Dr. Simons’ research focuses on developing new ways to promote remyelination of damaged axons in demyelinating diseases such as multiple sclerosis (MS). To reach this goal, his lab strives to better understand the cellular processes underlying myelin formation in normal development. Simons received his MD from the University of Heidelberg and did his residency in neurology at the University of Tübingen. He joined the University of Göttingen in 2004 and, in 2016, he moved to Munich to become Director of the Institute of Neuronal Cell Biology at the Technical University, and the German Center for Neurodegenerative Diseases.